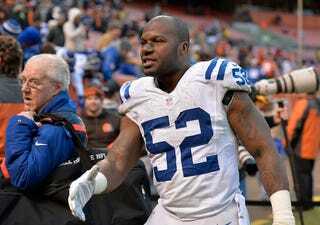 Washington D.C. police cited Colts linebacker D'Qwell Jackson for simple assault Tuesday after he allegedly twice punched a pizza delivery man in the head. The 31-year-old pizza delivery employee told police he said to Jackson that he was going to use the space momentarily, but Jackson allegedly got upset and told the driver to get the "expletive" out of his parking space before punching the driver in his face and on the back of his head. The delivery man wasn't seriously injured.